Gazebos are perfect for finding a quiet, solitary space to rest and relax or to host a large gruop in your yard. 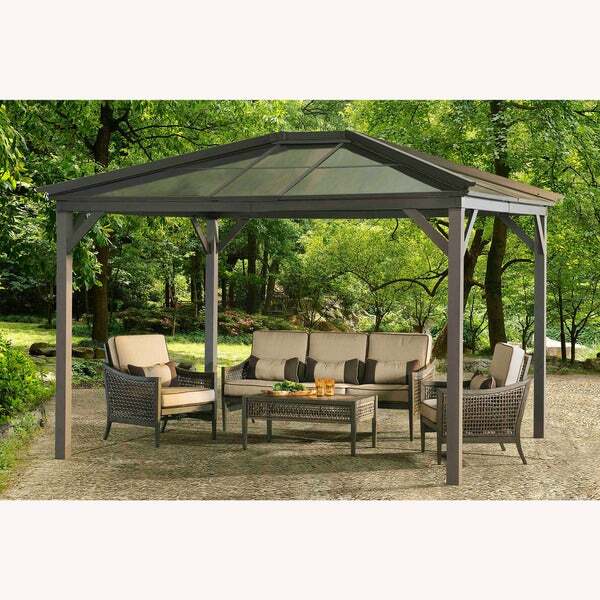 Shaded from the heat, this stylish and attractive Borneo Hard Top Gazebo will look beautiful in your backyard. Crafted of polywood and steel, this gazebo is durable and sturdy to keep your space looking good. The faux wood post has a functional hook in the center that can be used for lighting and can easily create a garden room for all four seasons. "How long do the roof panels last & can I get replacements for them when that time comes?" "What are the dimensions H, L, W?" This is approximately 144"L x 120"W x 115.5"H.
"Can it be attached to concrete patio? How difficult is it to assemble? Is the top made of clear plastic material in between the support beams? It is hard to tell in the pictures." This gazebo should have no issues being attached to a concrete patio with the proper anchors. According to a user review, they stated it took a while to assemble. The top is made of poly-carbonate. StaffSgt Adam & Amanda D.